The Appspace Core 5.3 build is a planned update that focuses on platform optimisation, enhancements and the latest bug fixes. This build was released on January 17th, 2015 and covers Appspace Cloud. Makes executing tasks on the fly a breeze. Allows you to re-run expired tasks or immediately run scheduled tasks. Account owners will be able to track all registered instances and license keys through a single, improved license page. The Company Profile page (previously from My Team) has also been consolidated under Accounts to centralise your account management experience. All SIP enhancements require Cisco Edge 340 firmware version 1.2. The SIP widget now functions as a global service therefore the need for a SIP widget to be present on every layout to maintain connection to the CUCM is no longer required. Updated SIP specific player properties. Able to detect if video stream is present. Network Administrators have now been given the right to delete networks. To prevent accidental deletions, a warning message will show items that will be affected by the deletion of the target network. In addition to being able to delete networks, network administrators are also able to move user groups. The Sign Manager’s Visual Editor (VE) now allows you to set a background color for a layout. 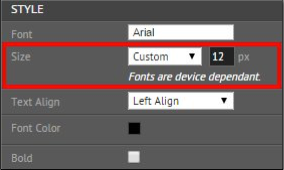 The Sign Manager’s Visual Editor (VE) now allows you to set custom font sizes for all text elements. The Add Media window now includes the Filter Pane to allow content filtering during media uploads. The application export function has been improved to follow the naming convention of the original application. Background agent handling Google Calendar data sources has been updated to work with Google API v3. AE-843: Unable to invite users, delete networks and change user(s) roles to owner. AE-913: No user role for deleting networks. AE-1077: CPU process reaching 100%. AE-1086: Imported application does not appear in the Dashboard. AE-1106: Data-only application appears as a Sign Manager application after import. AP-6426: Unable to retrieve widget when user’s permission is set to manage widget. AP-6430: Weather datasource displays wrong data. AP-6635: Application name doesn’t support more than 100 characters. AP-6837: MSSQL: Unable to login to Appspace. AP-6522: Users are able to edit descriptions for read-only content. AP-6583: Remove link doesn’t work in Upload Local Media window (Internet Explorer 11). AP-6524: ‘Set time zone’ icon disappears when Enforce Time Zone Configuration is disabled. AP-6700: Selected tab is not highlighted. AP-6705: Right border missing in Notification search box. AP-6500: Improper alignment of the change network link within the Settings tab. AP-6843: Improper alignment of the export application button with applications with long names. AP-6853: Add media search box allows more than 255 characters. AP-6866: Preview fails to load if VE window is already open. AP-6878: Runtime error when user imports invalid package. AP-6838: User name validation fails on Internet Explorer 11. AP-6876: Email validation fails on Internet Explorer 11.